I have not been able to post much recently. Part of the reason is I was visiting family in Michigan. While that leads to not much activity online, it did let me stock up on some new Michigan brews to try. First up is a beer from New Holland Brewing. As I have had a chance to try more of their beers, and I am becoming a fan. 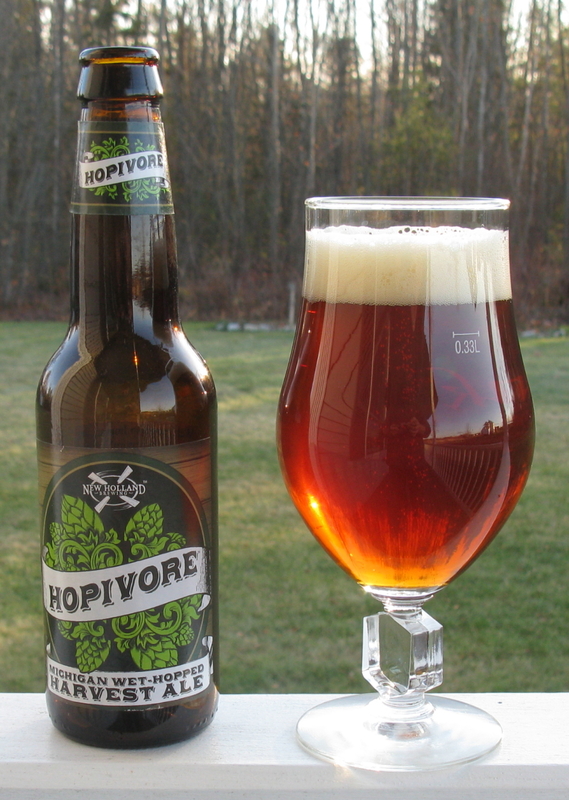 Hopivore is their wethopped ale. It was brewed with Cascade and Brewers Gold hops grown in Michigan. The hops are picked hours before going into the kettle, never having been dried. It was shipped in October of this year, so the bottle is about 8 weeks out. Critique — Well, I was expecting a super hoppy double IPA type thing, and what I got was more along the lines of an ESB. The hops seem much more English in character, I was surprised to see Cascade in the mix, as I really don’t get much of the citrus taste at all. I like it, but not the way I expected. It is actually the base of a good ESB, and I really like the nose. It was a bit too bitter for a ESB, and it was too malty for an American Pale. It is a pretty good beer, but just does not fit any particular style.